Do you ever get fixated on the idea of how a stamp should be used? I've been that way with the Wise Men stamp in the Season of Simple Grace stamp set. I've been determined to use them in jewel tone colors - coloring each one in a different color. I wanted to use them for a card class coming up next Saturday but I knew we didn't have time to color and probably trim out the wise men and do the coloring I have on other cards. 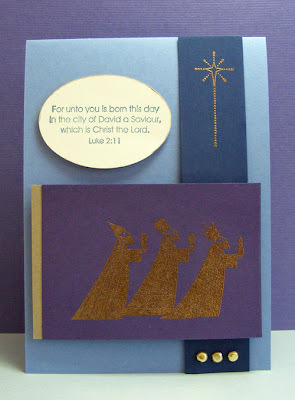 So I browsed Splitcoaststampers and found a great design by Jennifer Maloney which used gold embossing for the wise men. I changed the cardstock colors a little and added a strip of gold cardstock. Otherwise I kept the arrangment the same. This card comes together quickly with a lot of impact. I have two spots left for class Saturday November 14. We are making 8 total holiday cards. Please contact me by Tuesday if you are interested. Ingredients: Stamps: Season of Grace by Stampin' Up! Brads: gold from Stampin' Up!